Q) What does Percodan look like? 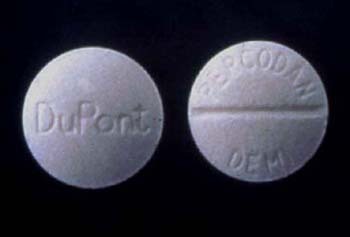 A) Percodan comes as a scored yellow tablet, embossed on one side with PERCODAN and on the other side with DuPont. Percodan-Demi comes as a scored pink tablet embossed on one side with PERCODAN-DEMI and on the other side with DuPont. Q) What are the effects of Percodan? Q) What is Percodan addiction? A) Everyone's body is different but as little as half a pill when combined with or other depressants can lower your respiratory system enough to kill you. Taken in high doses these tablets alone can kill you.